Despite weaker than expected retail sales reported yesterday EURUSD failed to hold at our initial support level of 1.3761 which leaves it vulnerable to the downside ahead of US PPI. 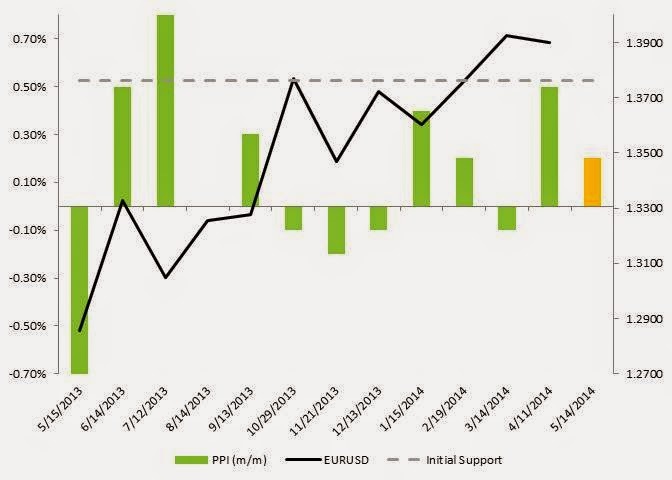 The EURUSD is poised to regain Technical ground if US PPI release meets expectations. The chart above further shows the negative correlation of their relationship. With no highly Iimpactful EUROZONE news on the table, Technical signs point to a BULLISH EURO. Technical Outlook: EURUSD Bearish below 1.3761 Support and if potential Dollar extension higher on better than expected economic news.